The Cooking Actress: PushPan Review and GIVEAWAY(CLOSED) for The Cooking Actress' 2nd Blogaversary! 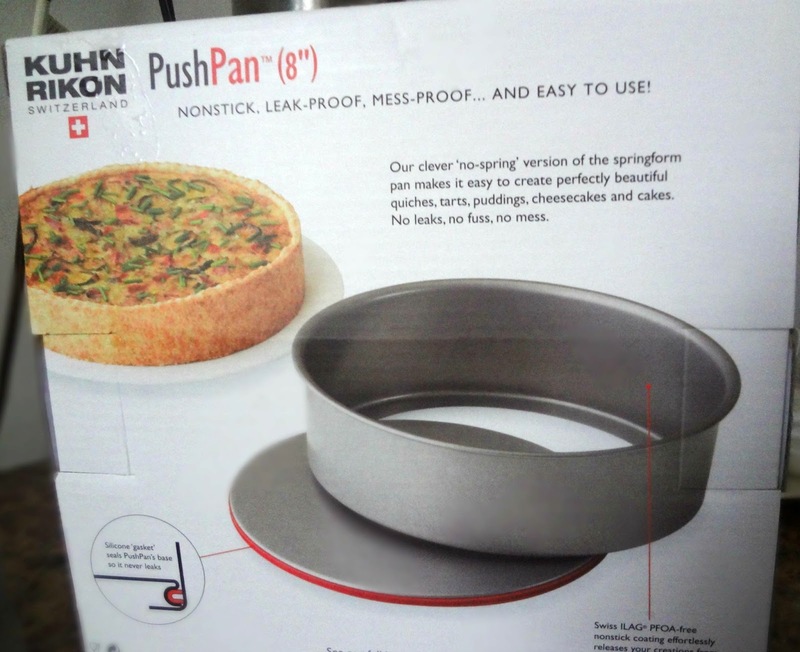 PushPan Review and GIVEAWAY(CLOSED) for The Cooking Actress' 2nd Blogaversary! Usually for anniversaries and birthdays, there are gifts, am I right? For my 2nd Blogaversary I am giving one of you guys, my amazing readers and friends, the opportunity to win a revolutionary piece of bakeware! A Kuhn Rikon PushPan! Ok, so, you're probably thinking "um...what's a pushpan?" Pretty much it's a springform pan (a kind of pan that has removable sides, which you use for any dessert that is too delicate to just be turned upside down to release from a pan. ), but it's a "no-spring" version-AND, best of all, it is LEAK PROOF! A lot of springform pans have the problem of leaking or having water from water baths (common for cheesecakes) leak in to the desserts. A quick fix to that is wrapping a layer of aluminum foil around the base, but why bother when you have the perfection of Kuhn Rikon's Leakproof PushPan! It's the perfect, no fail, way to make the perfect quiches, tarts, cheesecakes, layer cakes and more! Oven safe to 450 degrees F.
Can be refrigerated or frozen. The base is lined with a silicone ring that makes an airtight seal between the base of the pan and the sides, eliminating leaking and eliminating the need for additional rings of foil. Unlike a springform, the sides of the pans are very sturdy and unlikely to warp during cleaning or storage. They're non-stick, easy to release, and made of carbon steel, which helps products brown well and bake evenly. The above picture shows the bottom of the PushPan. As you can see it's almost like it's a pan within a pan, which contributes to how easily you can remove the base from the walls and prevent leaking! When preparing to use the PushPan, your first step (before even putting the base into the cake pan) is to thoroughly grease the inside of the pan and the top of the base (with non-stick cookinh oil, shortening, butter, etc.) Then, once greased, insert the base with the silicone ring facing towards the bottom and gently push it all the way down until it fits evenly in the bottom. Then you use it as you would any other pan until you're done baking! Then comes the fun part-pushing the baked item out of the pan! First, make sure it's completely cooled. 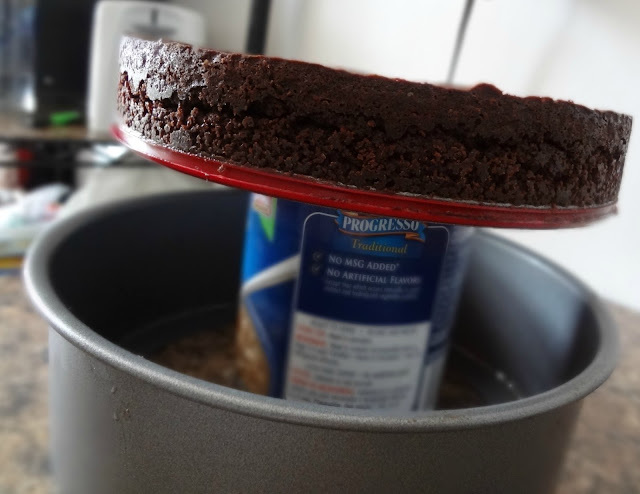 Now, place the push pan on something that is smaller, but taller than the pan (such as a small bowl or food can...I used a soup can)-make sure it's stable! 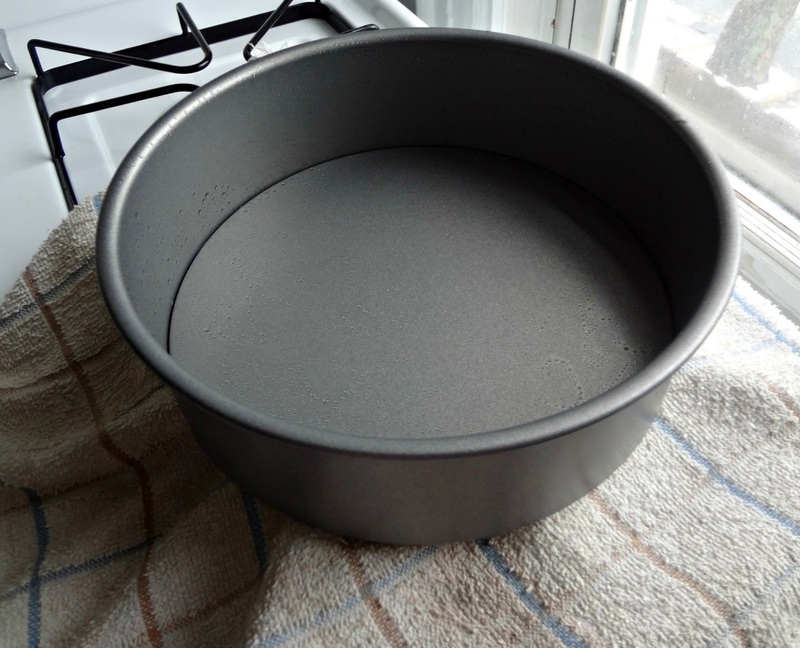 Take a hold of the top edge of the push pan, with each hand on opposite sides, and push the pan slowly and steadily down, watching the cake rise (although more accurately you're just removing the sides). 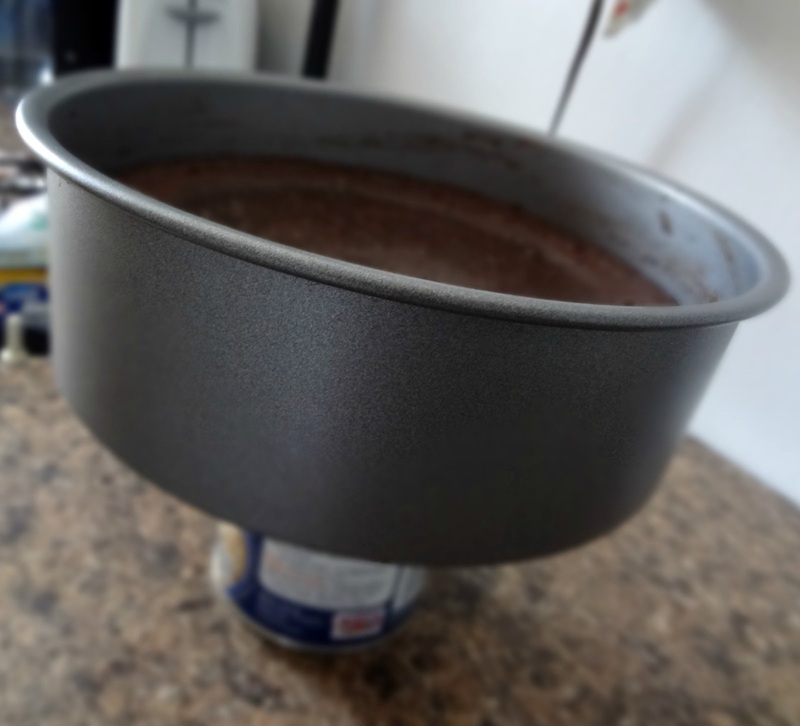 I was so excited to use my new PushPan to make that Chocolate Truffle Tart! Now don't you want one too??! "How would I use it...one word....CHEESECAKE!!! Thank you for the amazing opportunity!! Best of luck to everyone!!" Giveaway closes May 3, 2013, 12 AM EST. After the contest is over, I will send the winner an email (so please make sure you provide an email address or some other way to get in touch with you), and obtain shipping information (we do not share this information with anyone). The winner will have 3 days to respond or another winner will be chosen, all prizes will be awarded. The winner will be chosen via a random number generator. Open to U.S. residents over the age of 18. NO PURCHASE NECESSARY. 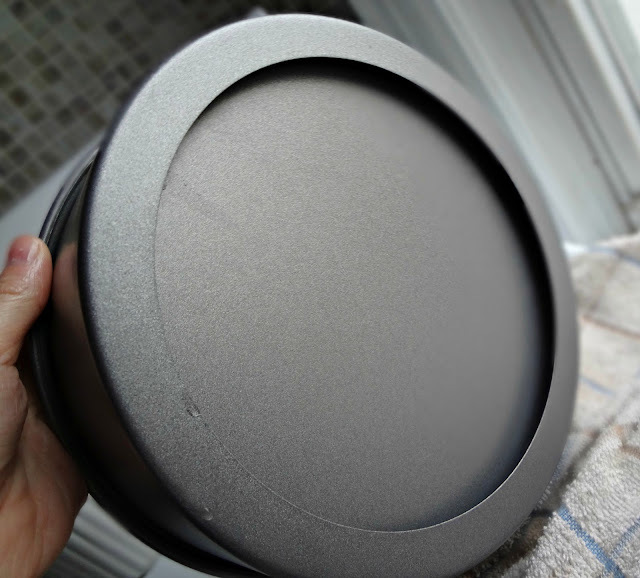 Leave a comment on this post telling me how you'd use your new PushPan (recipe links welcome)! Additional (optional) entries: (you will receive one additional entry for each of the following--so if you leave a comment for all of them, you can have a total of up to 8 entries/chances to win!) MAKE SURE TO LEAVE A SEPARATE COMMENT FOR EACH ENTRY-these entries are optional, not required. "Like" The Cooking Actress on Facebook-leave a comment on this post to let me know you did so. Follow The Cooking Actress on Pinterest-and leave a separate comment letting me know. Follow The Cooking Actress by email (look to the right of this post to find it)-leave another comment. Follow me on Twitter @kayleblogna-leave a separate comment on here to tell me. Follow me on Instagram @kayleblogna-leave another comment, saying you did so. "Like" Kuhn Rikon USA on Facebook-leave a comment on here letting me know. Follow @kuhnrikoncorp on Twitter-leave me another comment. Disclaimer: Kuhn Rikon provided me with product, and I was under no obligation to review if I so chose. Nor was I under any obligation to write a positive review or sponsor a product giveaway in return for the free product. My opinions, as always, are all my own. We are not liable for technical failures or typographical errors, or resolving identity disputes related to the winner.VOID WHERE PROHIBITED BY LAW.